Streetlights: energy wasters, light polluters, tax generators? Ross’s Feb. 2008 blog post touched on this issue, Municipal Energy Innovations, as did my Feb. 2009 blog post, A color change for downtown pedestrian light poles. Griff- I think the street lights add to the general security of the town. There is a reason that there is an old saying about meeting up with someone in a dark alley. Darkness is a cloak for all types of illegal activity, so as much as we can eliminate it in urban population concentrations, the safer we should be. These lights have been taken for granted for so many years as part of the infrastructure that I’m sure we as the general populace have lost sight of the actual cost of the things. Now, with the shrinking revenues available for public services, the increased costs can no longer be absorbed by the city budget. It is no surprise that we will have to pony up some more money to cover the cost. I would not be in favor of reducing or eliminating streetlights. My husband and I are not in favor of a monthly streetlight tax. We are residents that live downtown but have only lived in Northfield (and Minnesota) for a year now. We thought it was a joke when we heard about this. As for darkness as a cloak and linking it to illegal activity, isn’t that why we pay for police/law enforcement? Why should we be worried about streetlights and darkness in town if we have law enforcement doing their jobs? However, we also have an issue with a certain streetlight glaring through our blinds at night which causes quite a bright bedroom so I may be partial. I am well aware of budget cuts but why do we pay taxes if streetlights (and therefore protection) are not included? I’m sure there are other areas that could be looked into and reduced to ensure the streetlights remain lit. I would hope that the city government would make sacrifices and not require its citizens to do so. Several people where we are from are making fun of this town for this proposed tax I might add. Annie- I have also lived next to street lights that shine into the bedroom at night, so I know it can be an irritant. The issue with having police to enforce law and order is that they still have to see suspicious people at night. Night vision goggles are great in the military, but they are very expensive. Also, many criminal acivities are discovered first by observant residents and then dealt with by the police. The other way to see criminals at night is to use the spotlights on the squad cars. Use of these in residential neighborhoods at night is much more bothersome than a street light, IMO. Why should the operation and maintenance of city streetlights be funded through a utility rather than property taxes or Local Government Aid (LGA) from the state? The City Council would like to reduce the city’s dependency on LGA money from the state since it has become a less reliable source of funding in recent years. Relying on uncertain funds to pay for fixed costs such as streetlights can create funding gaps. A lack of funds for a critical city service means that the level of service will be reduced (bulbs are not replaced, lights are turned off). The Council would like to fund fixed-cost services through fixed sources of revenue such as utility fees. The operation and maintenance of more than 1,000 lights in the city-run streetlight network is basically a fixed cost. The cost to keep the lights on throughout the year and to replace fixtures and bulbs does not vary much from year to year. In 2008 this cost was roughly $227,000. The creation of the Streetlight Utility would also provide a source of funds to upgrade the current lighting to be more energy efficient reducing overall energy use and working towards the Council’s goal of sustainability. How does the streetlight network benefit the community? The streetlight network is a critical municipal service that benefits the community as a whole. The presence of functional streetlights increases property and personal security, traffic safety, and enhances pedestrian mobility. Residents and businesses within Northfield benefit from the presence and function of the streetlight network. Mobility and safety of traveling residents is increased by the presences of the streetlights. Businesses benefit from the increased safety of employees and customers traveling to and from their locations. The presence of streetlights also helps pedestrians (walking, bicycling, etc.) navigate throughout the City at night, particularly in winter months. What is the reasoning behind the streetlight utility fee structure? Based on the idea that the streetlight utility is a community benefit that assists travelers to and from properties, the City looked for a means to determine the number of travelers likely to visit different types of properties: residential, commercial, industrial, colleges, etc. The administration of the utility fees is intended to reflect many of the different property uses within the community, but also be simple enough that the cost of administration is not too high. Under the proposed fee structure: Single-family properties will pay a flat fee per month; All other types of properties in the city will pay a fee per acre each month. City Staff found a compromise between counting individual visitors to properties and reasonable staff time the a two-fold approach: Properties are classified by land use: single-family residential; commercial; industrial; public (government, churches, etc. ); multi-family residential; colleges; etc. The streetlight benefit of a property (the number of visitors) scales with the acreage of the property. The larger the property, the more likely it is that it has a greater benefit from the city’s streetlight network. In the next several weeks City staff will be developing an informational brochure on this item that will be posted to the City Web Site and provided in next months Commons Newsletter. Regardless of Joel’s excellent description of the benefits of street lights–it comes down to a simple issue. Will the city raise taxes to provide services or try to shift these costs to fees and other sources? As a CPA, I would rather you raise my taxes–which are deductible on individual tax returns–rather than a fee that only businesses get to deduct. Why wouldn’t everything be a fee? (This would be much better for businesses, which are not such a big user of city services.) How about a police fee based on how many cars you drive or teenagers you have in the house? How about a fire protection fee based on how big your house is and how far away it is from a fire hydrant? How about a fire hydrant fee? How about a police car fee based on disctance from the police station? How about taxing citizens for services, and communicating clearly to them what they are getting for their money? None of Joel Walinski’s responses really answers why the city would extract streetlights as a source for a separate fee but not, let’s say, sidewalks, stop signs, trees, or parks? These items are, essentially, fixed costs as well. If it’s already rolled into general property taxes, how is creating a separate fee for streetlights and a separate accounting step and payment structure, collection and its attendant logistics going to be cheaper than just bumping up property taxes the same amount? Would you not have to charge a higher fee to cover the extra overhead of serving this additional fee structure and collection process? I think the city is doing this simply to get around both colleges’ property tax exemptions, and to have a method of levying a “fee” (read: “tax”) on the colleges (and churches and hospital – they also don’t pay property taxes, I believe), but everyone else has to be assessed that tax as well, lest the city look too egregious in their targeting. However, I hope they are not considering Carleton’s arboretum (about 900 acres) and St. Olaf’s natural lands (about 700 acres) as part of their basis for the per acreage assessment. These areas on the campuses are not lit by streetlights, nor should they be, to any functional degree. I agree with Jane’s assessment, just raise the taxes to cover it, if that’s truly the goal. If that’s not the goal, and this is really just about surreptitiously taxing the colleges, then work something out with the colleges more openly and in good faith. Brendon- You gotta admit that the city isn’t leaving us in the dark about how they want to fund the street lights. Your assesment of getting the colleges and churches to shoulder their portion is probably correct. Although I doubt that anyone has a straight answer for that. Rochester Post-Bulletin, Oct 27: Rochester residents to pay to keep streetlights on. The fee would be assessed as a separate line item on Rochester Public Utilities customer bills. Residential customers would be charged about $2 per month, and commercial customers about $4 to $11 per month, depending on their size. The fee also would be assessed to nonprofit organizations, who, up to now, have not contributed anything. Churches, for example, would pay monthly fees of $4 to $6 per month, depending on their typical electricity use. was from the article, but I really question whether it is correct in its implications. John: The major flap is that one of the proposals would be to tax based upon the acreage involved for the property. Streetlights don’t light the “acreage”; they light the perimeter. So, I think the issue is about fair allocation of the costs. I think the best alternative is to tax just the residential properties. If businesses want streetlights turned on near them, they can pay the costs to have them turned on. What seemed to rankle many Chamber members (and non-Chamber businesses) was that they were not consulted beforehand. I think a number of the people thought that the train would have left the station if they hadn’t made a big issue of it. The Council seems to be talking some sense now on this issue. But, the whole process was a little disconcerting. David- Thanks for the clarification. I had missed the proposal that the “surcharge” could be based on the area of the property. I could understand an assessment based on the length of the frontage, but I agree that assessing a surcharge on the area of a property is not equitable. Oct. 20 Brainerd Dispatch (found via this MinnPost post): A bright idea? Council looks to save money on operation of streetlights. A pilot program to save money on the cost of operating streetlights is being considered in Brainerd. Tom Phelps, Brainerd Public Utilities superintendent, told the Personnel and Finance Committee he would prepare a plan that would include shutting off about 27 streetlights across north Brainerd. The Brainerd City Council unanimously approved the conceptual plan, to be finalized for action at the council’s Nov. 2 meeting. The pilot program would be for six months. Something of a tangent here, but I was delighted to see street lights installed at the intersection of Highway 246 and 110th St (County 1). This is outside the city limits — I assume they were installed by Mn/DOT — and not related to the tax, but I thought the timing of the installation was kind of funny, considering the controversy going on here. In any case, it should help make this very dangerous intersection (essentially a five-way — Gates Avenue/Rice 22 goes off at an angle) a bit safer. John, I’m not familiar with the CR9/Hwy 3 intersection, but as I’ve stated elsewhere, I believe intersection lighting is almost always beneficial. So this is good to hear. Were it feasible to light every intersection on roads >1000 ADT, I’d be for it. The city’s policy , as it applies to the colleges, is simply a method of trying to extract money, to make up for the city revenue losses. The City admits to having to try every method to try to replace the lost LGA funding; that’s understandable. What is not understandable, is once again, the lack of underlying POLICY discussion when a staff suggestion comes to the Council… and if I may say so, “trust” only in the Staff, and a lack of “candor” with the citizenry, as least as exhibited by their lack of discussion of differing opinions at council meetings, when a controversial subject arises. At the regular monthly Tuesday AM NDDC Forum, Dr. David Anderson (Pres of StO) was the speaker. He carefully , thoroughly explained the St Olaf financing structure. He emphasized, repeatedly, that 70 cents of every 1.00 of revenue that StOlaf receives comes from the revenues from students, tuition, etc. And that 70 cents FROM the STUDENTS is why he feels such a deep responsibility to consider THEIR return on investment. At the very end of his presentation, when an audience member asked him about further facilitating the relationship between the college and the city, Dr. Anderson replied that he values “…Trust and candor”. He then recounted being invited to lunch last summer by the City Administrator and the Mayor, where there was general “happy talk” (my shorthand; not his words). The very next morning, the article about the streetlight utility fees appeared on the NFNews front page. The “trust and candor” verbiage he had just stated was not lost on anyone. Dr. Anderson leaned on the front row chair, looked pointedly at Ms. Pownell, and said “If they did, it has not yet reached me”. Trust and candor… valuable principles to be included in any relationship. I agree that street lights are neccesary at some critical intersections, but beyond that I see little use for them. There is little evidence that they contribute to reducing crime, particularly in a city like Northfield. We are able to safely drive down country roads without street lights, at speeds well in excess of those allowed in town- why light straightaways and the middle of blocks in town? It just wastes energy and contributes to light pollution and light trespass. It seems to me that if the city wants to charge me for a streetlight next to or near my house, I, along with my neighbors, should have the right to tell the city to turn the damn thing off. Thank you, William, for illuminating a larger issue here (pun intended): Does extra lighting actually reduce crime and accidents? I have heard it does not, or at least not as much as popular opinion would lead us to believe. Perhaps I’m wrong on that, but it came up when Carleton was in a frenzy to put up a lot more lighting on campus about 8 or 9 years ago. The alumni listserv lit up (sorry, couldn’t resist) with opinions, but several commentors cited studies that lighting didn’t do anything for reducing crime or accidents. Just my observations of the difficulties that street lighting causes when I’m driving. I’d much rather drive in darkness using only headlights. As one who runs at night, apart from the random morons who shout things at you from passing cars, I worry every time as I’m entering a pool of light that an oncoming car is being partially blinded by that same light. William- I’m sure the debate about crime prevention effectiveness of public lighting will continue for some time. I’m not sure your analogy between a residential street and a country road is quite applicable. In the country, there are very few areas where there are 3 dozen houses in a quarter mile within 30 ft. of the road. The other thing to consider is the number of mercury vapor lights at farmsteads. I remember the days before their popular use, and how things such as gasoline and tools seemed to “walk off” during the night. I am not particularly upset about a streetlight fee – given the cuts in state aid, and the need to preserve city services. However, I completely agree with the goal of minimizing the installation/use of city lights. The night sky is beautiful, and eyes adjust quite well to the relative darkness of the night – unless, of course, they’ve been repeatedly exposed to the pools of light under the streetlights. How about a movement to save energy, cut city budgets, and beautify the city night by turning off street lights? That’s a win/win/win situation: the City cuts energy and maintenance costs / we cut light pollution / and I don’t pay the fee! I’m wondering what happens if folks just refuse to pay the streetlight fee? The City shuts off the light nearest your residence? Hooray! I like it! All politics is local, after all, and it doesn’t get any local-er than that! Anyone know if local businesses have been cutting back on their parking lot lighting? Someone recently told me that Target, Menards, and Kmart had cut back but I don’t know if its true. Brendon/Patrick: I would love to see N’field start turning out the lights…both publicly and privately. The night is never “pitch black”…well maybe when we first walk out of a bright house…but then, shades of grey and blue- perhaps brightened by moonlight. As to mercury vapor lights on farms: I thought one reason people lived in the country was to be close to nature??? Isn’t darkness natural? If you have people lurking around the farm at night…get a couple junkyard dogs. 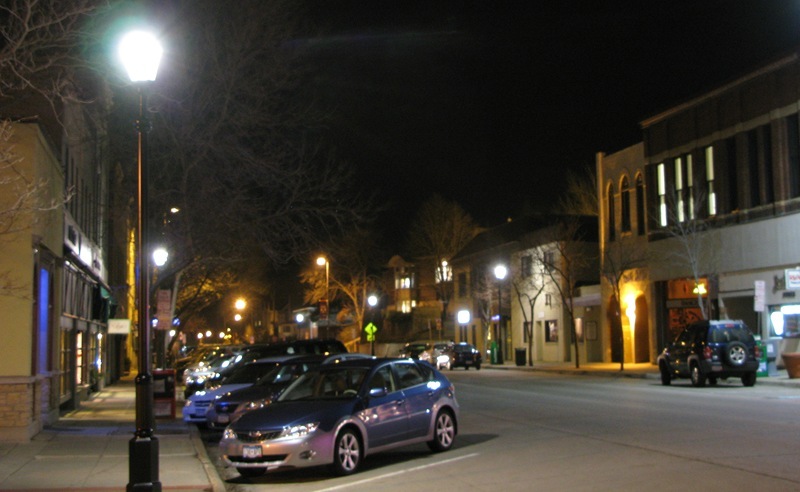 I think the argument some folks were making a few years back here at Carleton – apart from the light pollution complaints – was that well-lit areas and buildings do not necessarily experience less crime than dark areas and buildings. I do not know if that’s true, but it’s the argument I remember some people making about lighting issues on campus. William- I grew up in the country because my family farmed. It really upset my father when someone came on the farm at night and stole something. Where I grew up, a good watch dog was a must. The only problem was if the dog decided to go on a nocturnal hunting expedition. The advent of the mercury lights was a real godsend for security. I really don’t care what the urbanites use as a reason to move to the country. There are some realities of living there that need to be considered. Brandon- I lifted this quote from the 2009 handbook for Clarkson university. I think it is some good advice. wooded areas, dark alleys or parking lots. You can read the whole handbook at this site. It is often amusing over what issues people get their undies in a bunch, but I must admit, this street light issue takes the cake for me. The whole world is going to the hot place in a handbasket, and were honestly wringing our hands over streetlights? Sorry if I offended anyone with that opinion, but I have a hard time taking some of this seriously. John…National Geographic takes light pollution ‘seriously’ to the extend that they devoted an entire issue to it about a year ago. I’m not ‘wringing my hands’ over it…it is more like a pet peeve. But believe me, many people are seriously involved in the issue for some very good reasons. Take a look at the International Dark-Sky Association’s website…you’ll find that many individuals and government entities are working tirelessly to reduce the light pollution and energy waste of unnecessary outdoor lighting. No one is suggesting that some amount of safety and/or security lighting is appropriate. But suggesting that those who question “how much” are somehow silly, simply reflects your lack of knowledge regarding the issue. William- I subscribe to National Geographic, and they take a lot of things seriously that I don’t, but I still enjoy reading the magazine. As to “how much” lighting is necessary for public safety, this is probably debateable, so I have no problem with anyone researching it. I would also agree that some of the light levels in parking lots that allow you to find a dime on the asphalt at midnight is excessive. I have appreciated this light in the past when I have dropped my keys unlocking the car door. Of course, with the electric locks on the cars that have them, this is a problem that people who own them do not experience. I stll say that safety should trump personal preference, but I agree that there needs to be some type of standardization. I haven’t looked yet, but I would not be surprised if there are guidelines in the UBC and various insurance publications. Ditto what William wrote. This is not something that keeps me awake at night, though I would imagine excessive ambient light from outside might actually keep some people awake at night. Undies are not bunched up here. I’m not saying some lighting isn’t necessary, but I would argue that lighting is not as effective as we (or Clarkson or Carleton or etc… pretty much all colleges have the same things in their student handbooks) would believe in reducing crime and accidents. A friend of mine posited that a criminal is far more noticeable if he has to carry a flashlight to break into a business than if he simply uses the light being conveniently provided by the establishment itself. You are also assuming that whoever stole from your family’s farm all those years ago would not have been able to do so had there been lights. That would presume that some member of the family was awake watching for thieves every night. I grew up (mostly) in the country too, and darkness is a prized rural characteristic. One that should be preserved. William — I agree with John that it’s not a fair comparison between sub/urban residential streets and rural roads. Another major difference is the presence and cautiousness of pedestrians and cyclists. There will always be more pedestrians in a city, and since it’s a largely pedestrian environment, they won’t be as cautious when crossing streets. Since pedestrians don’t generally come with headlights, intersection lighting is critical for their safety. The only streets I’m aware of that are significantly lit up midblock are Highway 3 (especially necessary where bike lanes are present) and Division Street (an obviously pedestrian-oriented area). Brendon & William- I will grant you this one concern I have had with ambient lighting. The new reflective paint that MNDOT is using to mark lanes on roadways seems to disappear at night if there is a lot of street lighting and it is raining. I don’t know what it is about the paint, but it is like it loses its reflective properties when it is wet. I don’t fault the street lights for the problem. I can at least see the intersection. I fault the paint, as it is especially hard to see lane divisions. Seems like it was not this way ten years ago, or perhaps my eyesight is getting worse with age. Sean…Then you agree that mid-block lighting in residential areas is, in most cases, unnecessary? William, yes, unnecessary unless the blocks are long enough that no light at all is cast on the sidewalk at points (which can lead to tripping on uneven surface or slipping on ice). I do not think the standard 400-foot Northfield block requires mid-block lighting. Responding to the “tax generators” portion of this title: Two articles on MinnPost that are related; one about MN justices expressing judicial anger at Pawlenty because of a rise in attorney licensing fees, and the second announcing that the Unallotment case against Gov. Pawlenty begins in court on Monday, and the MN House is moving towards joining in… and not on Pawlenty’s side. Lots of resentment about special taxes being presented as “fees”.